The Hunger Games is one of a handful of books from recent years that I would immediately identify as one of my favorites. 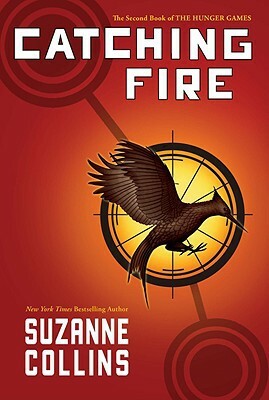 Catching Fire continues Suzanne Collins' amazing story, and Mockingjay, released today, brings the series to its conclusion. After surviving the 74th Annual Hunger Games, Katniss Everdeen is beginning to settle into life back in District Twelve. She now lives with her mother and sister in the Victor’s Village with District Twelve’s previous survivors of the Hunger Games. (It's a small neighborhood.) But Katniss dreads the upcoming Victory Tour where she must travel - or be paraded by the Capital - to the other eleven districts. Before she leaves, and adding to her dismay, Katniss receives a visit from President Snow himself. The president delivers news of potential uprisings in other districts along with several thinly veiled threats. Unintentionally, it appears the way Katniss survived the Hunger Games has given people across the districts … let's see ... what could it be … hope? Now she’s instructed to do whatever necessary to stop it. And just in case she’s unable to slow this new hope, this hope that’s catching fire across Panem, the Capital has a few surprises prepared for Katniss, her friends and family, and the previous Hunger Games victors. The 75th Hunger Games is quickly approaching, and every twenty-five years the Capital holds a Quarter Quell. The 25th anniversary declared that each district was to hold an election to choose their tributes. In other words each district was ordered to select the children likely to die. The 50th anniversary declared that each district was to send twice as many tributes, two male and two female each. What does the Capital have in store for the 75th anniversary? Might it include Katniss, the girl responsible for the unrest throughout Panem? Might the Capital want to send a message to Katniss and the nation reminding them of the Capital’s authority? I read The Hitchhikers Guide to the Galaxy years ago. Okay, in truth, it was actually years and years ago. (A significant difference.) 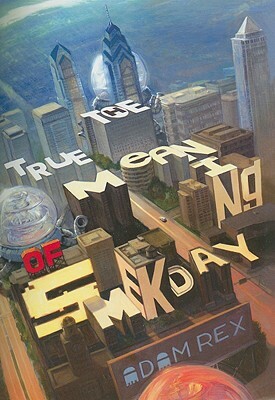 But reading The True Meaning of Smekday brought back visions of “several dozen huge yellow chunky slablike somethings, huge as office blocks, silent as birds” sailing over Earth. No, in Smekday the Earth is not destroyed to make room for a hyperspace bypass, but nevertheless the appearance of the Boov over the Earth, some in “ships the size of Rhode Island” appearing over major cities of the world from New York to London to Moscow, reminded me of Douglas Adams’ classic. Even if the Boov ships look like jellyfish. Gratuity Tucci, known to her friends as Tip, explains the Boov’s intentions. They believe Earth is rightfully theirs because they discovered it. Colonizing new worlds is their destiny. They were sorry for the inconvenience, but humans will surely assimilate into Boov society. Disagree and your leaders will meet messy ends. Tip was concerned ever since her mother’s night time abduction. Soon her mother is taken by the Boov permanently. When the Boov realize the humans won’t just give in, Captain Smek himself appears on TV and orders the “Noble Savages of Earth” to move to “Human Preserves.” Americans get Florida. Eleven-and-a-half-year-old Tip decides to drive rather than take the rocketpods provided by the Boov. Tip, her cat named Pig, and the car end up in a hole in the highway - Boov created, of course, to persuade humans to take the rocketpods. A Boov who calls himself J.Lo and claiming to be Chief Maintenance Officer Boov, discovers them and offers to fix their car. It’s an odd offer, but Tip soon learns that J.Lo himself is trying to keep other Boov from finding him. There’s plenty more to cover, including what happens in Arizona, the Gorg, incidents and residents in Roswell, allergies, plenty of explosions, and a wonderfully satisfying conclusion, but I’ve already strayed to a video from Oh Brother Where Art Thou, so we’d better just wrap it up and call it good. Middle graders and above will appreciate The True Meaning of Smekday. Girls will like the female protagonist who’s unafraid to travel across the country or to look a Gorg in the eye, and boys will like the action and explosions and the whole take-over-the-Earth thing. Teachers will like it because Adam Rex has given them another book that can be added to the shelf that won’t spend much time there. Vacations are generally for rest and relaxation and the opportunity to enjoy different activities in different parts of the world. 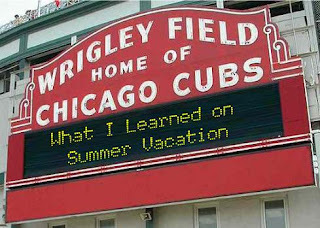 But whether intentional or not, there's always something to be learned on vacation. School is quickly approaching, and as a favor to my kids – I hope their teachers aren’t reading this – I thought I’d give them a leg up on that traditional back-to-school paragraph. So here you are kiddos, cut and paste. This summer my parents took me to Chicago. We did the normal stuff like shop downtown, eat at cool restaurants and go to the Museum of Science and Industry, but by far the most educational experience was going to a baseball game at Wrigley Field. I didn’t think taking a train would work because, like, where do you put the tables and chairs and coolers and stuff? I’ve been to a Brewers game or two, you know? Then I learned you don’t tailgate at Wrigley. Really, I’m serious. No tailgating. Instead of parking lots, a neighborhood surrounds the stadium. There are apartment buildings across the street from the outfield. Home runs can - boink! - hit someone’s front porch. And get this. There are bleachers on the apartment buildings. So, like, you could say, “Hey wanna play catch in the yard?” and your buddy could say back, “Nah. Let’s go on the roof and watch the Cubs.” Then my dad said you still have to pay a bunch of money to sit up there, so what the heck? Might as well buy tickets. Some Cubs fans’ vocabulary is colorful. (That’s the word my dad used – colorful.) I didn’t hear any colors, but I did hear things like “Blankety-blank Brewers fans!” When we were there, the Brewers won 18 to 1, so I even heard Cubs fans use “blankety-blank” followed by the names of Cubs players. No, “blankey-blank” is not a compliment. There was this guy sitting next to my dad, and he said it looked like Abe Frohman, sausage king of Chicago. So I thought I’d meet someone famous or something and I was bugging my dad to introduce me until Dad told me to be quiet before he got snooty. Or snotty. Whatever. He’s the one who brought it up. Finally, after the Cubs lose again and you’re leaving the game, hold tight on to Mom or Dad’s hand. That’s important. There’s a bajillion people leaving the park, and they’re all headed to the L. That’s a river of people, and you don’t want to float away from your parents. I did a lot and learned a lot this summer, but there ain’t no education like the one I got at 1060 West Addison.